Mutations are changes in the genetic sequence, and they are a main cause of diversity among organisms. These changes occur at many different levels, and they can have widely differing consequences. In biological systems that are capable of reproduction, we must first focus on whether they are heritable; specifically, some mutations affect only the individual that carries them, while others affect all of the carrier organism's offspring, and further descendants. For mutations to affect an organism's descendants, they must: 1) occur in cells that produce the next generation, and 2) affect the hereditary material. Ultimately, the interplay between inherited mutations and environmental pressures generates diversity among species. Mutations affect the genetic code of DNA or RNA. The question is whether mutations, which happen by mindless naturalistic processes, are responsible for the increase in new specified information in DNA which is required for the acquisition of new functional features which were not initially present in a life form. Mutations are essential raw materials for evolution. Talk Origins - Claim CB101: Most mutations are harmful, so the overall effect of mutations is harmful. No. Most mutations are neither harmful nor helpful. Talk Origins - Are Mutations Harmful? UNDER the neutral model, newly arising mutations fall into two major fitness classes: strongly deleterious and selectively neutral (Kimura 1968; King and Jukes 1969). The first class is well supported by mutation accumulation experiments (reviewed in Simmons and Crow 1977; Halligan and Keightley 2009) and early DNA sequence comparisons (Grunstein et al. 1976; Kafatos et al. 1977) and is shared among competing evolutionary models. The novel and controversial aspect of the neutral theory was the proposition that, among mutations that go to fixation, the vast majority are selectively neutral. Advantageous substitutions, although important in phenotypic evolution, are sufficiently rare at the molecular level that they need not be considered to adequately model the process. To date, most studies have suggested that most mutations with phenotypic effects tend to be deleterious to fitness. However, Shaw et al., studying the effect of mutations on fitness in Arabidopsis thaliana, now suggest that mutations can often have beneficial effects. These findings have been questioned by Keightley and Lynch. In summary, the vast majority of mutations are deleterious. This is one of the most well-established principles of evolutionary genetics, supported by both molecular and quantitative-genetic data. This provides an explanation for many key genetic properties of natural and laboratory populations. Deleterious mutations present a significant obstacle to adaptive evolution. Deleterious mutations can inhibit the spread of linked adaptive mutations through a population; conversely, adaptive substitutions can increase the frequency of linked deleterious mutations and even result in their fixation. The neutral theory by Kimura, quickly followed by King and Jukes' own findings, led to a fierce debate about the relevance of neo-Darwinism at the molecular level. The Neutral theory of molecular evolution states that most mutations are deleterious and quickly removed by natural selection, but of the remaining ones, the vast majority are neutral with respect to fitness while the amount of advantageous mutations is vanishingly small. Mutations are exceedingly harmful instead of beneficial. Natural selection only prevents harmful mutations from surviving. In observable reality the mutations that are beneficial cause microevolution, i.e. variety within a species. Darwin's finches for example show that all kinds of beak sizes are possible within the genetic makeup of finches. But no beak ever changed into anything but a beak and all the finches have always remained finches. Countless fruit fly mutations never resulted in anything but fruit flies of which most were crippled. Mutations result from errors during DNA replication or other types of damage to DNA... Mutations are caused by radiation, viruses, transposons and mutagenic chemicals, as well as errors that occur during meiosis or DNA replication. They can also be induced by the organism itself, by cellular processes such as hypermutation. Errors Are a Natural Part of DNA Replication ... Fixing Mistakes in DNA Replication ... When Replication Errors Become Mutations ... Even Low Mutation Rates Can Be Cause for Concern. It can of course not come as a surprise that mutations are harmful when we know what causes them. Reality is quite different than evolutionists like to imagine. Mutations are errors which cause damage to the existing specified information in DNA with observable results. All cancers begin when one or more genes in a cell are mutated, or changed. ... There are two basic types of genetic mutations: Acquired mutations are the most common cause of cancer. These occur from damage to genes during a person's life. ... Germline mutations, which are less common, are passed directly from a parent to a child. In these situations, the mutation can be found in every cell of a person's body, including the reproductive sperm cells in a boy's body and egg cells in a girl's body. DNA in cells suffers a wide range of damage... 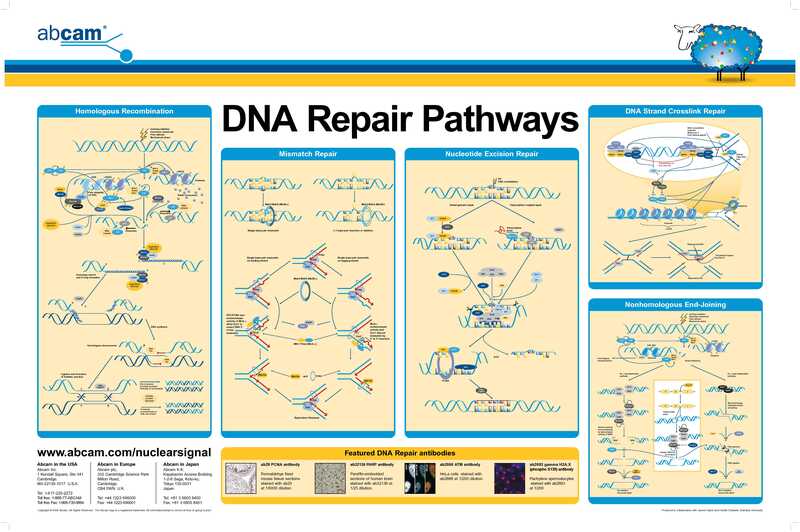 The importance of effective DNA repair systems is highlighted by the severe diseases affecting people with deficient repair systems... To cope with all these forms of damage, cells must be capable of several different types of DNA repair. DNA repair seldom involves simply undoing the change that caused the damage. Almost always a stretch of DNA containing the damaged nucleotide(s) is excised and the gap filled by resynthesis. In most cases, the extensive network of DNA repair machinery that exists in the cell halts cell division before an incorrectly placed nucleotide is set in place and a mismatch is made in the complementary strand. However, if the repair machinery does not catch the mistake before the complementary strand is formed, the mutation is established in the cell. This mutation can then be inherited in daughter cells or in embryos. Mutations have been observed that increase or decrease the size of some portion (or portions) of a living organism. ... Mutations have been observed that change the shape of a living organism. ... Mutations have been observed that duplicate existing features (cows with two heads, flies with extra wings, etc.). ... No mutation has ever been observed that provides a new function (sight, hearing, smell, lactation, etc.) in a living organism that did not previously have that function. ... Mutation and artificial selection have not been demonstrated to be sufficient to bring about new life forms from existing ones. Biological or genetic evolution is not observed. What we see is degeneration instead of evolution. Learn Genetics - What Is Mutation?